Here, at last, is a fresh, new way to think about Jewish food. In The Seasonal Jewish Kitchen (Sterling Epicure, August 2015 and already in its second printing), I take you far beyond deli meats and kugel to a world of flavors ideal for modern meals. 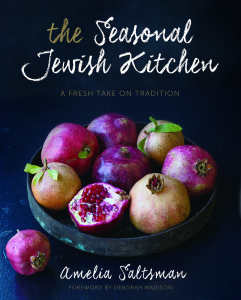 Inspired by my passion for seasonal cooking, my 150 soul-satisfying recipes (plus countless variations and kitchen ideas) offer a refreshingly different take on Jewish cuisine. In my newest book, I trace the delicious thread of Jewish cuisine from its ancient roots to today’s focus on seasonality and sustainability. Guided by the lunar Jewish calendar, I’ve divided the book into six micro-seasons that highlight the deep connection of Jewish traditions to the year’s natural cycles. And, I draw on my own diverse food history to bring you a personal cookbook filled with intuitive spins on beloved classics and bold new dishes. From my Iraqi grandmother’s kitchri–red lentils melted into rice with garlic slow-cooked to sweetness—to four-ingredient Golden Borscht with Buttermilk and Fresh Ginger and vibrant Blood Orange and Olive Oil Polenta Upside-Down Cake, this is a game-changing approach for a new generation of cooks. You’ll find naturally vegan dishes, Middle Eastern fare, and new ways to use Old World ingredients—buckwheat, home-cured herring, and gribenes—in fresh, modern meals. For more than thirty years, the Santa Monica Farmers’ Market has inspired both renowned chefs and home cooks, making it a regional market with national presence. For most of those years, Amelia Saltsman has shopped its stands, talked with its farmers, and cooked its magnificent produce for family and friends. 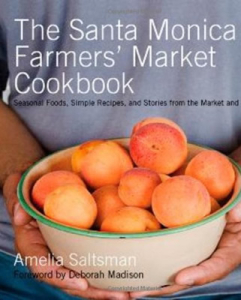 The result is Amelia’s award-winning first cookbook, The Santa Monica Farmers’ Market Cookbook, a celebration of the market’s excellence and its hardworking farmers. 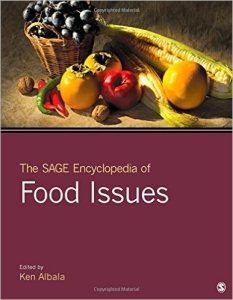 Now in its sixth printing, this nationally acclaimed classic was named by Cooking Light as one of the Top 100 Cookbooks of the Last 25 Years and is the recipient of multiple honors, including the SMPL Green Prize for Sustainable Literature, National Indie Excellence Book Award (finalist), PubWest Book Design Award, and the Writers’ Digest Grand Prize for Self-Published Books. The SMFM Cookbook has been translated into Braille and was a featured KCRW Cookbook Club selection. Filled with more than 100 of Amelia’s signature simple, intuitive recipes, including: Fava Bean and Pea Shoot Salad; Classic Tomato Soup with a Goat Cheese Swirl; Black Cod with Green Tomatoes; Roast Leg of Lamb with Oil-Cured Black Olives and Herbs; Seared White Nectarines with Burnt Honey; and Meyer Lemon Sundaes with Cara Cara Oranges and Tangelos. Wherever you live, this is the only cookbook you’ll need to help you shop, store, and cook brilliantly from your local farmers’ market! The ultimate guide to easy, local, sustainable entertaining in season — now in ebook form, it’s easier than ever to access Amelia Saltsman’s tricks and techniques to simple, delicious cooking from local farmers’ markets. This seasonal “bite-size package” offers three menu chapters, each with recipes, entertaining tips, wine suggestions, shopping lists, and a countdown plan. There are also sections on how to shop at a farmers’ market, suggestions for useful kitchen tools and pantry items, and basic cooking techniques, as well as the Roasted Seasonal Vegetable Primer, an indispensable master recipe tool for every home cook. 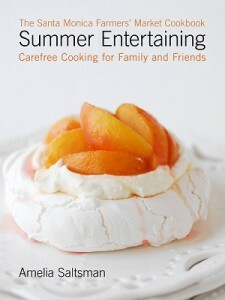 Illustrated with food photography by Staci Valentine, the book showcases the best of summer foods. Wherever readers live, they will enjoy serving such simple showstoppers as Green Zebra Tomato Gazpacho; Cherry and Almond Salad; and Roast Halibut Loin with Black Olives and Summer Herbs.